Jeanne had also been living in a loveless marriage to her husband Nick for more than a decade. Towards the end of their marriage, she couldn’t remember the last time she and her husband had kissed or even held hands. She was feeling discarded, abandoned and completely alone. He put it all back on her to save what was left of the marriage. He made her feel like there was something wrong with her and that the troubles they were having were her issue (or maybe she was just crazy and this was all in her head). With that one response, he abandoned her again. What she didn’t realize then, that she realizes now, is that she was already alone, long before the marriage actually ended. Kate had been diagnosed with fibromyalgia and doing everything she could to take care of herself and their children. It was during that time that she found out that her husband hadn’t really just been working extra-long hours with lots of travel. He had been having an affair with a co-worker while she was struggling with her health. What Kate later realized was that she had been alone for a very long time; before the last child, before the diagnosis and long before the affair. Paul tried everything he could to make the relationship work with Brittany for years. He forgave her time and again for being unfaithful. He believed her when she told him that even when she’s with other men, “All I can think about is you.” Paul was alone for most of the time that he and Brittany were together. When people are considering the incredibly difficult decision to leave a relationship, many times the thing that keeps them stuck long past the relationships’ expiration date is the fear of being alone. But what if that thing they fear the most – being alone – has already happened, slowly over time? People leave relationships long before the relationship actually ends. They may leave mentally, emotionally or physically (by not being present and / or sharing their love with someone else). 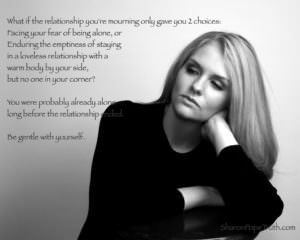 Enduring the emptiness of staying in a loveless relationship with a warm body by your side, but no one in your corner. If so, now is the perfect time to stop beating yourself up for a relationship that fell apart. Now is the perfect time to forgive yourself for what you didn’t say or didn’t see. Now is the perfect time to recognize that you may have done the most compassionate and self-loving thing you’ve done for yourself in a long-time by leaving.